Here’s a recent example of our work to show how our web design services will greatly enhance your business internet presence. Call us toll-free 844 Geek-NYC (844) 433-5692 if you are looking for a site redesign or if you would like us to build you a site from scratch. 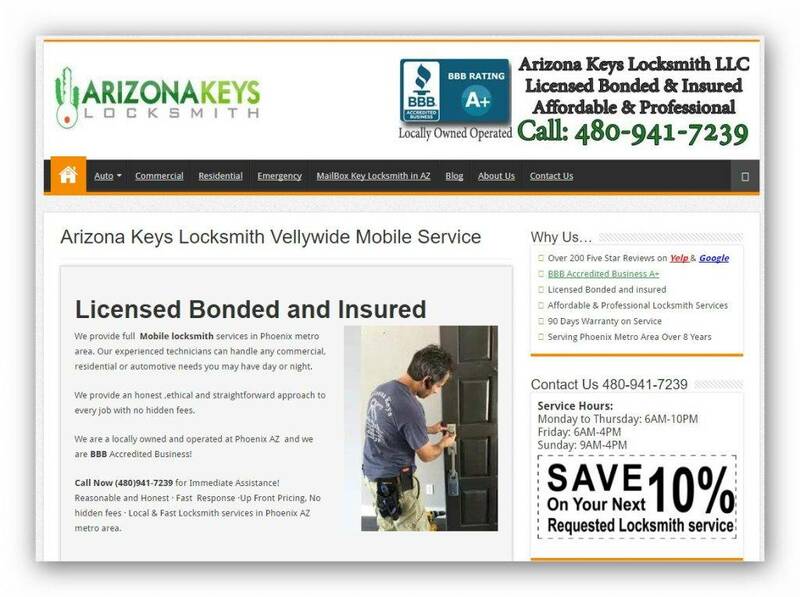 Using our expertise and professional approach to web design, our New-York City team updated, improved and vastly redesigned a website for Arizona Keys Locksmith. We made the website effective in SEO (search engine optimization), in social media and digital marketing. In essence, we created a whole new website that was relevant, responsive and rapid, everything that a small business website needs to be. Here are details of some of the improvements we made to the website using our advanced web design skills. The original website, which was operative online in 2014 and 2015 was uninviting. The fonts were too small and too many keywords were crammed into the site, making it a victim of keyword stuffing. The page’s web design was boring. Also, it was unfriendly to mobile users. Few could doubt that it needed a redesign, so we gave it one — a bright new one. When we found out that the firm did not have a logo we designed one for them. At the client’s request, the logo design included a green color rather than the dull brown that had characterized the previous website. 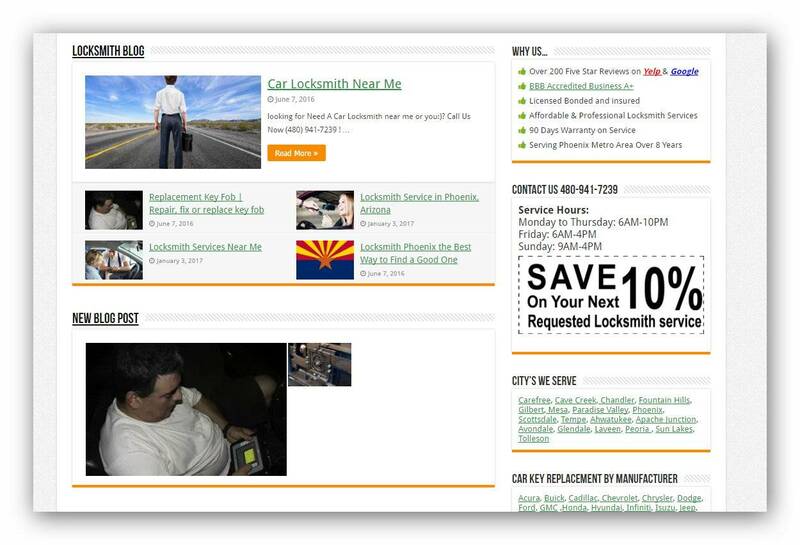 The logo design, which we placed at the top of the locksmith website design, showed a cactus, symbolizing the company’s Arizona presence, and a core, reflecting on the nature of the firm. Because the company has many satisfied clients and provides excellent service, we set aside a section in the locksmith website design to showcase its reviews. In a box with the title “Why us..” we included a link to a separate page that opens in a new window when the user clicks on the link. It showcases some 200 credible reviews. 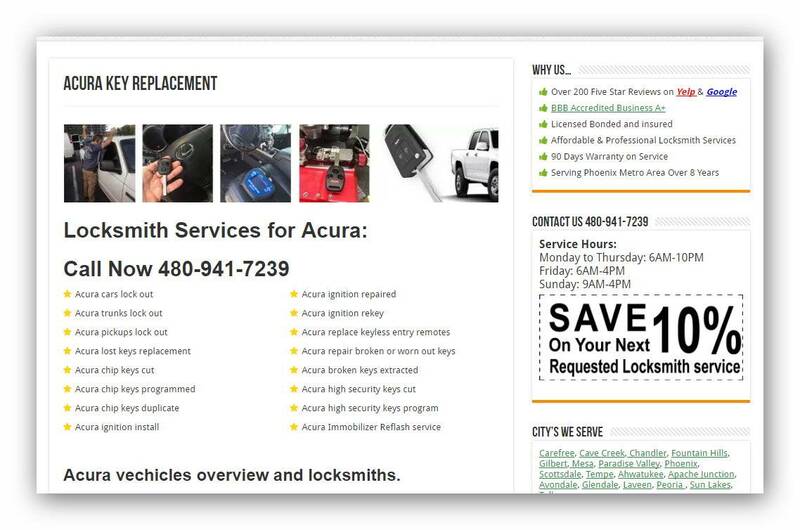 To encourage users to use the locksmith’s services, we included several additions aimed at boosting the company’s digital marketing efforts. We designed a coupon for the site on which users can click to obtain a discount. 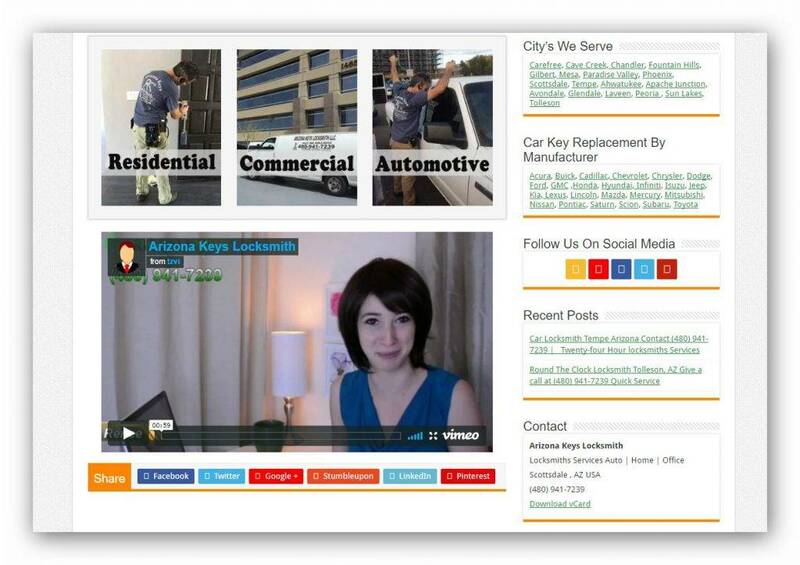 We also created links to social media; We added a “call now” button. In the footer, we gave the client an opportunity to tell how good his services are and to encourage users to call him. We made sure that the site looks equally attractive and works as well on laptop computers, tablets, and smartphones. It also passes tests on Google developer sites on speed, security, professionalism and most of the keywords are number 1 in their rankings.